For the power management process in computing, see Hibernation (computing). "Hibernate" redirects here. For the Java database library, see Hibernate (framework). Hibernation is a state of inactivity and metabolic depression in endotherms. Hibernation refers to a season of heterothermy that is characterized by low body temperature, slow breathing and heart rate, and low metabolic rate. Although traditionally reserved for "deep" hibernators such as rodents, the term has been redefined to include animals such as bears and is now applied based on active metabolic suppression rather than based on absolute body temperature decline. Many experts believe that the processes of daily torpor and hibernation form a continuum and utilize similar mechanisms. The equivalent during the summer months is known as aestivation. Some reptile species (ectotherms) are said to brumate, or undergo brumation, but any possible similarities between brumation and hibernation are not firmly established. Some insects, such as the wasp Polistes exclamans, hibernate by aggregating together in groups in protected places called hibernacula. Often associated with low temperatures, the function of hibernation is to conserve energy during a period when sufficient food is unavailable. To achieve this energy saving, an endotherm will first decrease its metabolic rate, which then decreases body temperature. Hibernation may last several days, weeks, or months depending on the species, ambient temperature, time of year, and individual's body condition. Before entering hibernation, animals need to store enough energy to last through the entire winter. Larger species become hyperphagic and eat a large amount of food and store the energy in fat deposits. In many small species, food caching replaces eating and becoming fat. Some species of mammals hibernate while gestating young, which are either born while the mother hibernates or shortly afterwards. For example, the female polar bear goes into hibernation during the cold winter months to give birth to her offspring. She loses 15–27% of her pre-hibernation weight and uses stored fats for energy during times of food scarcity, or hibernation. It is evident that pregnant female polar bears significantly increase body mass prior to hibernation, and this increase is further reflected in the weight of their offspring. The fat accumulation prior to hibernation in female polar bears enables them to provide a sufficient and warm, nurturing environment for their newborns. While hibernation has long been studied in rodents, namely ground squirrels, no primate or tropical mammal was known to hibernate prior to the discovery that the fat-tailed dwarf lemur of Madagascar hibernates in tree holes for seven months of the year. Malagasy winter temperatures sometimes rise to over 30 °C (86 °F), so hibernation is not exclusively an adaptation to low ambient temperatures. The hibernation of this lemur is strongly dependent on the thermal behaviour of its tree hole: if the hole is poorly insulated, the lemur's body temperature fluctuates widely, passively following the ambient temperature; if well insulated, the body temperature stays fairly constant and the animal undergoes regular spells of arousal. Dausmann found that hypometabolism in hibernating animals is not necessarily coupled to a low body temperature. Bears are able to recycle their proteins and urine, allowing them to both stop urinating for months and stop muscle atrophy. Note that in some languages a specific term is used to describe the type of hibernation undergone by bears. For example, in French it is called "hivernation" (not to be confused with "hivernage" which means "overwintering") instead of "hibernation". Obligate hibernators are defined as animals that spontaneously, and annually, enter hibernation regardless of ambient temperature and access to food. Obligate hibernators include many species of ground squirrels, other rodents, mouse lemurs, the European hedgehog and other insectivores, monotremes, marsupials, and even butterflies such as the small tortoiseshell. These undergo what has been traditionally called "hibernation": the physiological state where the body temperature drops to near ambient (environmental) temperature, and heart and respiration rates slow drastically. The typical winter season for these hibernators is characterized by periods of torpor interrupted by periodic, euthermic arousals, wherein body temperatures and heart rates are restored to euthermic (more typical) levels. The cause and purpose of these arousals is still not clear. The question of why hibernators may experience the periodic arousals (returns to high body temperature) has plagued researchers for decades, and while there is still no clear-cut explanation, there are myriad hypotheses on the topic. One favored hypothesis is that hibernators build a 'sleep debt' during hibernation, and so must occasionally warm up in order to sleep. This has been supported by evidence in the Arctic ground squirrel. 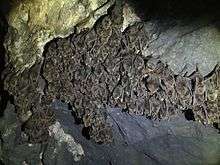 Another theory states that the brief periods of high body temperature during hibernation are used by the animal to restore its available energy sources. Yet another theory states that the frequent returns to high body temperature allow mammals to initiate an immune response. Hibernating Arctic ground squirrels may exhibit abdominal temperatures as low as -2.9 °C, maintaining sub-zero abdominal temperatures for more than three weeks at a time, although the temperatures at the head and neck remain at 0 ˚C or above. Historically there was a question of whether or not bears truly hibernate, since they experience only a modest decline in body temperature (3–5 K) compared with what other hibernators undergo (32 K or more). Many researchers thought that their deep sleep was not comparable with true, deep hibernation. This theory has been refuted by recent research in captive black bears. 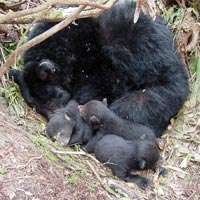 Black bear mother and cubs "denning"
Unlike obligate hibernators, facultative hibernators only enter hibernation when either cold stressed or food deprived, or both. A good example of the differences between the two types of hibernation can be seen among the prairie dogs: the white-tailed prairie dog is an obligate hibernator and the closely related black-tailed prairie dog is a facultative hibernator. Historically, Pliny the Elder believed swallows hibernated, and ornithologist Gilbert White pointed to anecdotal evidence in The Natural History of Selborne that indicated as much. Birds typically do not hibernate, instead utilizing torpor. One known exception is the common poorwill (Phalaenoptilus nuttallii), first documented by Edmund Jaeger. Fish are ectothermic, and so, by definition, cannot hibernate because they cannot actively down-regulate their body temperature or their metabolic rate. However, they can experience decreased metabolic rates associated with colder environments and/or low oxygen availability (hypoxia) and can experience dormancy. For a couple of generations during the 20th century it was thought that basking sharks settled to the floor of the North Sea and became dormant. Research by Dr David Sims in 2003 dispelled this hypothesis, showing that the sharks actively traveled huge distances throughout the seasons, tracking the areas with the highest quantity of plankton. The epaulette sharks have been documented to be able to survive for long periods of time without oxygen, even being left high and dry, and at temperatures of up to 26 °C (79 °F). Other animals able to survive long periods with no or very little oxygen include the goldfish, the red-eared slider turtle, the wood frog, and the bar-headed goose. However, the ability to survive hypoxic or anoxic conditions is not the same, nor closely related, to endotherm hibernation. Hibernation induction trigger (HIT) is somewhat of a misnomer. Although research in the 1990s hinted at the ability to induce torpor in animals by injection of blood taken from a hibernating animal, further research has been unable to reproduce this phenomenon. Despite the inability to induce torpor, there are substances in hibernator blood that can lend protection to organs for possible transplant. Researchers were able to prolong the life of an isolated pig's heart with a HIT. This may have potentially important implications for organ transplant, as it could allow organs to survive for up to 18 or more hours, outside the human body. This would be a great improvement from the current 6 hours. This supposed HIT is a mixture derived from serum, including at least one opioid-like substance. DADLE is an opioid that in some experiments has been shown to have similar functional properties. There are many research projects currently investigating how to achieve "induced hibernation" in humans. This ability to hibernate humans would be useful for a number of reasons, such as saving the lives of seriously ill or injured people by temporarily putting them in a state of hibernation until treatment can be given. Anna Bågenholm, a Swedish radiologist who in 1999 survived 80 minutes under ice in a frozen stream in Norway, the final 40 minutes in a state of cardiac arrest, and survived with no brain damage. John Smith, a 14-year-old boy who survived 15 minutes under ice in a frozen lake before paramedics arrived to pull him onto dry land and saved him. Karolina Olsson, the "Sleeping Beauty of Oknö"
↑ Watts PD, Oritsland NA, Jonkel C, Ronald K (1981). "Mammalian hibernation and the oxygen consumption of a denning black bear (Ursus americanus)". Comparative Biochemistry and Physiology A. 69 (1): 121–3. doi:10.1016/0300-9629(81)90645-9. 1 2 Geiser, Fritz (2004). "Metabolic Rate and Body Temperature Reduction During Hibernation and Daily Torpor". Annu. Rev. Physiol. 66: 239–274. doi:10.1146/annurev.physiol.66.032102.115105. ↑ Humphries, M. M.; Thomas, D.W.; Kramer, D.L. (2003). "The role of energy availability in mammalian hibernation: A cost-benefit approach". Physiological and Biochemical Zoology. 76 (2): 165–179. doi:10.1086/367950. PMID 12794670. ↑ Hellgren, Eric C. (1998). "Physiology of Hibernation in Bears". Ursus. 10: 467–477. JSTOR 3873159. ↑ Dausmann, K.H. ; Glos, J.; Ganzhorn, J.U. ; Heldmaier, G. (2005). "Hibernation in the tropics: lessons from a primate". Journal of Comparative Physiology B. 175 (3): 147–155. doi:10.1007/s00360-004-0470-0. PMID 15682314. ↑ Blanco, M. B.; Dausmann, K.; Ranaivoarisoa, J. F.; Yoder, A. D. (2013). "Underground Hibernation in a Primate". Scientific Reports. 3. doi:10.1038/srep01768. ↑ Dausmann, K. H.; Glos, J.; Ganzhorn, J.U. ; Heldmaier, G. "Physiology: Hibernation in a tropical primate". 429 (6994): 825–826. doi:10.1038/429825a. PMID 15215852. ↑ Lundberg, D.A. ; Nelson, R.A.; Wahner, H.W. ; Jones, J.D. (1976). "Protein metabolism in the black bear before and during hibernation". Mayo Clinnic Proceedings. 51 (11): 716–722. ↑ Nelson, R.A. (1980). "Protein and fat metabolism in hibernating bears". FASEB J. 39 (12): 2955–2958. PMID 6998737. ↑ R. R. Baker (1972). "Territorial Behaviour of the Nymphalid Butterflies, Aglais urticae (L.) and Inachis io (L.)". Journal of Animal Ecology. 41 (2): 453–469. doi:10.2307/3480. ↑ Daan S, Barnes BM, Strijkstra AM (1991). "Warming up for sleep? Ground squirrels sleep during arousals from hibernation". Neurosci. Lett. 128 (2): 265–8. doi:10.1016/0304-3940(91)90276-Y. PMID 1945046. ↑ Galster, W.; Morrison, P.R. (1975). "Gluconeogenesis in arctic ground squirrels between periods of hibernation". American Journal of Physiology. 228 (1): 325–330. PMID 1147024. ↑ Prendergast, B.J. ; Freeman, D.A. ; Zucker, I.; Nelson, R.J. (2002). "Periodic arousal from hibernation is necessary for initiation of immune responses in ground squirrels". AJP: Regu. Physiol. 282 (4): R1054–R1062. doi:10.1152/ajpregu.00562.2001. PMID 11893609. ↑ Barnes, Brian M. (30 June 1989). "Freeze Avoidance in a Mammal: Body Temperatures Below 0 °C in an Arctic Hibernator" (PDF). Science. American Association for the Advancement of Science. 244 (4912): 1593–1595. doi:10.1126/science.2740905. PMID 2740905. Retrieved 2008-11-23. ↑ Toien, Oivind; Black, J.; Edgar, D.M. ; Grahn, D.A. ; Heller, H.C.; Barnes, B.M. (February 2011). "Black Bears: Independence of Metabolic Suppression from temperature". Science. 331 (6019): 906–909. doi:10.1126/science.1199435. PMID 21330544. ↑ Harlow, H.J. ; Frank, C.L. (2001). "The role of dietary fatty acids in the evolution of spontaneous and facultative hibernation patterns in prairie dogs". J. Comp. Physiol. B. 171: 77–84. doi:10.1007/s003600000148. ↑ Jaeger, Edmund C. (May–June 1949). "Further Observations on the Hibernation of the Poor-will". The Condor. 3. 51: 105–109. doi:10.2307/1365104. JSTOR 1365104. Earlier I gave an account (Condor, 50, 1948:45) of the behavior of a Poor-will (Phalaenoptilus nuttallinii) which I found in a state of profound torpidity in the winter of 1946-47 in the Chuckawalla Mountains of the Colorado Desert, California. ↑ "Seasonal movements and behavior of basking sharks from archival tagging" (PDF). Marine Ecology Progress Series. 248: 187–196. 2003. doi:10.3354/meps248187. ↑ "A Shark With an Amazing Party Trick". New Scientist. 177 (2385): 46. 8 March 2003. Retrieved 2006-10-06. ↑ Douglas Fox (March 8, 2003). "Breathless: A shark with an amazing party trick is teaching doctors how to protect the brains of stroke patients". New Scientist. Vol. 177 no. 2385. p. 46. Archived from the original on February 29, 2012. Retrieved November 9, 2006. ↑ Oeltgen PR, Nilekani SP, Nuchols PA, Spurrier WA, Su TP (1988). "Further studies on opioids and hibernation: delta opioid receptor ligand selectively induced hibernation in summer-active ground squirrels". Life Sc. 43 (19): 1565–74. doi:10.1016/0024-3205(88)90406-7. PMID 2904105. ↑ Britt, Robert (April 21, 2005). "New Hibernation Technique might work on humans". LiveScience. ↑ Harlow, John (May 27, 2007). "Race to be first to 'hibernate' human beings". Times Online (from The Sunday Times). Archived from the original on August 7, 2008. ↑ "Japanese man in mystery survival". BBC News. December 21, 2006. ↑ "Eleva boy's story part of national tour to honor Mayo Clinics 150 years". Mayo Clinic. Archived from the original on May 11, 2015. ↑ Dovey, Dana (February 6, 2015). "Suspended Animation? How A Boy Survived 15 Minutes Trapped Under Ice In Frozen Lake". Medical Daily. Hibernation (2012). McGraw-Hill Encyclopedia of Science and Technology. 1–20 (11th ed.). McGraw-Hill. Look up hibernation in Wiktionary, the free dictionary. Wikimedia Commons has media related to Hibernation.